In the 2003 World Series of Poker’s (WSOP) $2,500 buy-in limit Hold’em tournament, I found myself heads up with Young Phan. In 2001, I was heads up with Scotty Nguyen in Omaha 8/b with a chance to win my eighth title; I lost. In 2002, I was heads up with Johnny Chan in no limit Hold’em with a chance to win number eight; I lost–instead Chan won #7 to tie me. This time I needed to win! Especially because I was at the peak of my poker powers. Unfortunately, I don’t seem to reach the peak of my poker powers too often, therefore when I do, I need to go ahead and use all of my powers to win!! I was playing great poker, and I was ready to win, but Young wasn’t going for it! Back and forth we battled, 100 hands, then 200 hands, then we crested 300 hands of one on one poker, and neither one of us would back down. When we were playing $3,000-$6,000 limit when the following hand came up; and gave me the confidence to win–and perhaps took a little steam out of Young Phan’s sails. I raised with K-10 off suit before the flop, and the flop came down 2s-4s-7h. Finally I decided to trust my instincts, and called the $6,000 bet (in my mind I believed that Young had a straight draw of some sort like 6-8). The last card was the 9s, for 2s-4s-7h-7d-9s, and Young bet out $6,000 again. The flush had hit! Now I could only beat a busted straight draw. But I thought that that was exactly what Phan had, so I called the $6,000 bet without too much hesitation. When Young rapped the table, meaning that he was bluffing, I jumped out of my seat. After all, this was a super tough call, and I had made it! 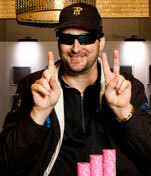 I heard the internet announcer–Mark Seif–in the back round saying, “Incredible, I mean what a great call Phil Hellmuth just made with king high. The flush hit, the pairs were there, in fact he couldn’t beat anything but a busted straight draw, yet he called with K-10 high!” I’m sure that Young heard that as well. When you make a great call like that, it shows you that your instincts and reads are dead on (it gives you some confidence in your style of play). It can also demoralize your opponent a bit. But too Young’s credit, I didn’t see him lower the level of his play very much at all. Later on at the $4,000-$8,000 limit, I had Young down to $22,000 and all-in with 4d-5h, up against my 4-4. It came all red, and the last card made Phan a flush. Next hand Phan had A-4, to my 10-9, and I flopped a flush draw, and missed; Young now had $88,000 again! The third hand, however, proved to be a monster. Young made it $16,000 to go with what he later said was A-8, and I made it $24,000 to go with A-Q. I bet the flop of 10-8-4, and Young called. A Q hit on the turn, and I decided that Young would bet if I checked here. I checked, and Young came out firing $16,000, and I check raised making it $32,000 to go. I noticed that he only had $24,000 left, so I announced, “I bet $16,000 in the dark.” The river was an A, for a board of 10-8-4-Q-A, and now Phan called me quickly. By the way, if he had A-8, then not raising here turned out to be a great move! It was all over the next hand when Young and I were all-in in the dark, his 6-2 to my 6-4, and a turn 4 gave me my eighth WSOP Championship. It would have tied me for the all time record, but Doyle had won number 9 one week earlier. Oh well, at least I gave myself some breathing room against Johnny Chan, at least for three days, until he won number 8 to tie me. Seriously though, I’m not rooting against anyone else in poker. Doyle winning number 9, at age 70, is awesome; go Doyle go! And Chan winning number 8, Ferguson winning numbers 4 and 5, and Seidel winning number 6 is great theatre and drama for poker and the WSOP! Boys, I’ll raise y’all to 20! I hope that everyone enjoyed this week’s Hand of the Week’. Good luck playing your hands this week.